A majority of voters support Obama-era net neutrality rules, but almost 1 in 5 don’t think it was wrong for the Republican-led Federal Communication Commission to repeal the 2015 regulations. 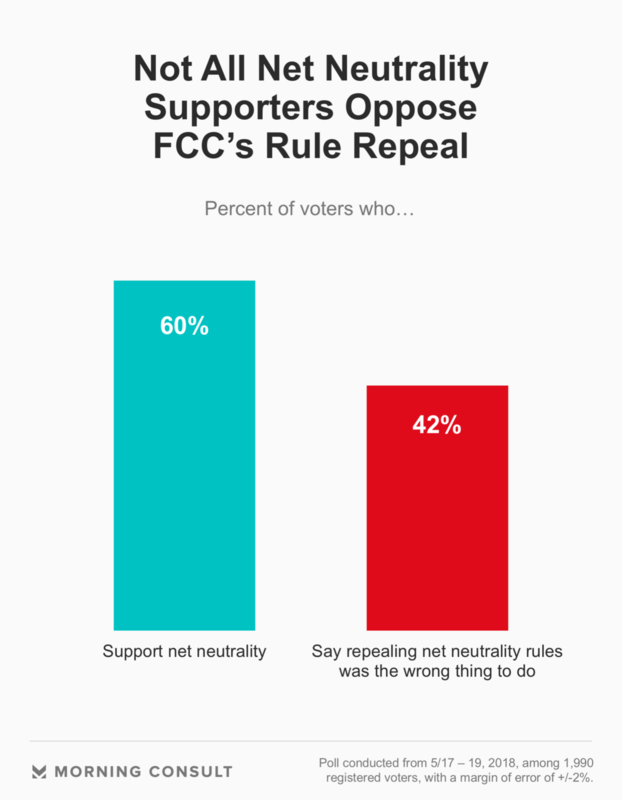 Sixty percent of registered voters in a May 17-19 Morning Consult/Politico poll said they support net neutrality rules, while responses to a separate question found that 42 percent said repealing net neutrality was the wrong thing to do. The figures represent an 18 point gap between voters who support the rules and those who oppose their repeal. Seventeen percent of voters said they oppose net neutrality rules, and 19 percent said repealing the regulations was the right call. The nationwide survey of 1,990 registered voters has a margin of error of plus or minus 2 percentage points. The FCC, led by Chairman Ajit Pai (R), voted along party lines Dec. 14 to reverse the 2015 Open Internet Order, which barred broadband providers from blocking, throttling or prioritizing online content. The final version of the new order, published in February, erased those prohibitions on internet service providers and instead required ISPs to disclose related information. Those new rules will take effect June 11. “They like the idea of net neutrality, but don’t really understand it or how it is enforced,” Silver added. Support for net neutrality has grown by double digits since the FCC’s December vote. In a Dec. 14-18 Morning Consult/Politico poll, 49 percent of registered voters said they support net neutrality. “The FCC is proposing dismantling the rules and removing basically all net neutrality rules and all oversight of broadband,” said Evan Engstrom, executive director at Engine, a San Francisco-based advocacy group for tech startups. That viewpoint isn’t shared by Betsy Huber, president of the National Grange, who said in a May 17 interview that the 2015 Open Internet Order put too many restrictions on ISPs and ended up hurting the expansion of internet access into rural areas. The National Grange is a Washington-based organization that advocates for rural issues. Huber said Congress needs to make laws that address the concerns of blocking and charging for priority services, instead of the federal government using a regulatory order that treats the internet like a monopoly. “What we need is for Congress to step in and pass a law updating the FCC’s authority and giving the FCC clear instructions for how Congress wants the agency to approach ISPs,” said Hurwitz.